Rolf Palm Turner and sculptor b. 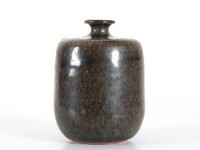 1930, started his career as a trainee at Andersson & Johansson at Höganäs Keramik, then studies at the Technical School. Palm started his own workshop in Sälggatan in Höganäs in 1950 where he stayed for 10 years. After the period of Höganäs, he moved to Molle 1960 where he continued his activities. The production consisted of sculptures as well as useful and decorative ceramics, often with experimental glazes, moreover, he made a lot of miniatures in stoneware. He went out of business around 2005. Exhibitions at the National Museum in Stockholm, Röhsska Museum in Gothenburg, Norrköping Art Museum, Höganäs Museum, Malmö Museum and Helsingborgs Museum. 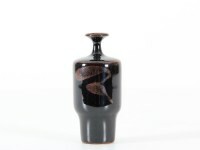 Unique stoneware vase brown glaze. Rolf Palm, own studio, Mölle, Höganäs, 1971.